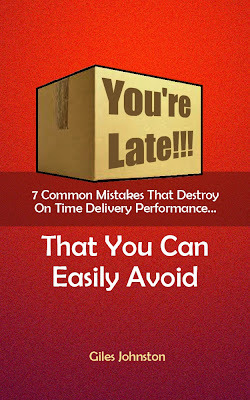 Yesterday I wrote about the importance of checklists and how they can help you to improve your on time delivery performance. There is also a time to realise that you don't need to spend more time developing business processes. This is the point when 'execution' beats 'thinking'. I see lots of instances where this is the case. Effective processes have been drawn up, decisions have been made, instructions have been written... but nothing changes. The strategies to design a good process and the strategies to implement a good process are not always the same. Designing the process can be fun, intellectually challenging and a diversion from the other day to day activities taking place within the business. Implementing the process can be difficult, argument inducing and confusing, at times. I sat in a meeting last week and this topic came up. The management team were trying to come up with a new process to help their business' performance improve. They wanted some changes made to their existing ways of working to improve the start of projects (and hence the on time completion of the same projects). They already have the processes mapped out, it was just that their staff weren't following the processes! But, I had the same conversation the week before, and the week before that. It is a common problem; in many cases it is easier to design a good process than to deliver a good process. And so there ends today's lesson(!). If you aren't making the progress that you would have hoped for and are spending time developing new and better business processes, with the original processes never having been fully implemented - STOP! Take a look at how you deploy your processes and see if you can change your approach* here. Today might be the day to do a little less designing and little more doing. * If you would like some ideas on how to change your approach, try out Making It Happen. The first month is free ($7 per month thereafter) and it is designed to help you implement changes faster and more effectively into your business. You can find out more here.